Award-winning Producer, interactive producer, and editor of independent documentary films. 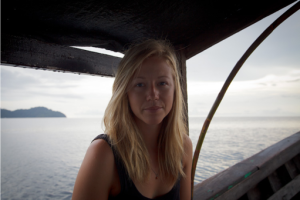 Her company Ten Thousand Images AS is based in Norway, and continues to prouduce high quality independent documentary films, with a special focus on ocean-related initiatives. 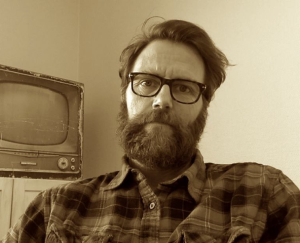 Award-winning Producer, interactive producer, and founder of Hallum & Jensen A/S. Christian has been working with Project Moken since 2010. Today he produces for Vinland – Good Stories AS. A positive person who loves his job; working as an underwater photographer on a Andaman Ocean Safaris day trip boat in Phuket Thailand. Henrik came to Thailand nine years ago to become a Scuba instructor and decided to stay. Now he is married with a 4 year old daughter. Henrik joined the Project Moken team on the 2011 expedition as an underwater photographer. Nguk Suriyan Katale (Hook) is one of the best free-divers on Mu Koh Surin and the main character in our film “No Word for Worry”. He is one among few Moken of his generation to have grown up in a Kabang, and belongs to a handful who can still sail one. Hook is an excellent spear-fisherman, he Captains his own Longtail, and he is a skilled navigator. As well as being an active participant in social media venues he is also a wiz on computer handling. He holds a PADI Rescue-divers certificate and has experience from working in the tourist diving industry. Hook has been a guide for Project Moken since 2007, and was the Captain on our Kabang expedition up the Norwegian coast. Languages: Moken, Thai, and a fair understanding of English. Ngui Tawan Katale is Hook’s older brother. Is today the official leader-figure for the Moken on Mu Koh Surin. He lives there with his family, and is responsible for maintaining the last Kabang in Thailand. He is skilled in various fishing techniques, and Captains his own Longtail. Ngui is successful in small-scale business venues, providing sea cucumbers for the Japanese market and trading handicraft products. He is the youngest capable boat builder on their island. 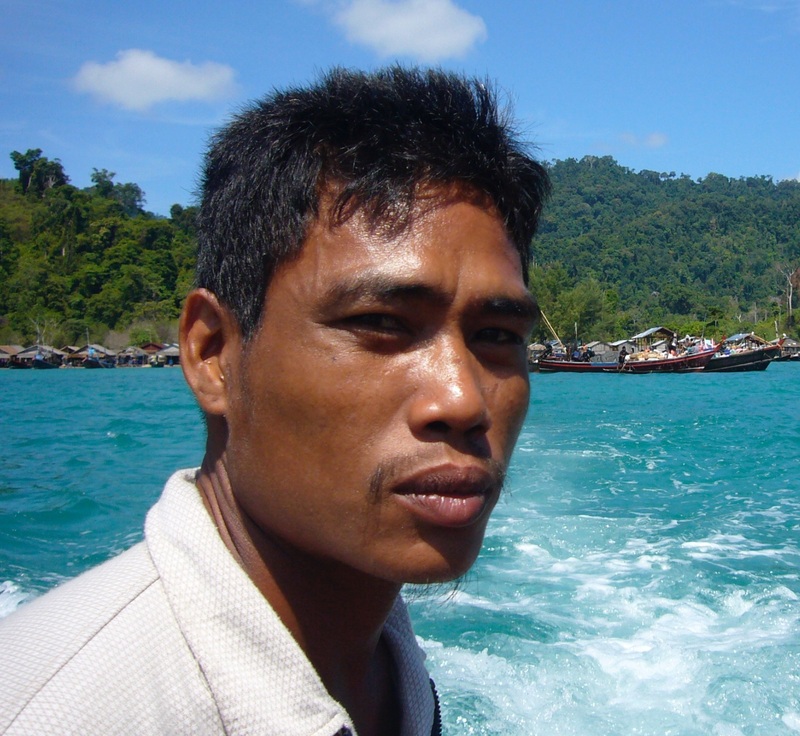 Ngui was Helmsman on the Norwegian Kabang expedition. Languages: Moken & Thai. 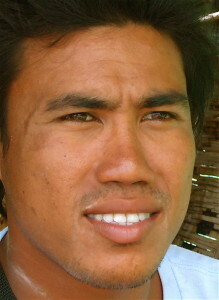 Jao Ketala is the previous leader-figure for the Moken on Mu Koh Surin. He grew up as a nomad in a traditional Kabang, and is the one that will lead and guide us through the building of the first Project Moken Kabang. His expertise will contribute to teaching the younger generation these traditional boat-building skills. In recent years Jao has settled on the mainland, and his new home functions as a contact point between the two worlds. Tanit Noisuchon is a certified captain with his own Longtail boat. He isresponsible for the logistics at sea, as well as being the interpreter for the project. He has been part of all the research-trips since 2006, and as a result has become a close friend of the Moken on Mu Koh Surin. He is responsible for the budget and administration in Thailand through the company Lucky Run Longtail Cat Co., Ltd.
Potjanee Noisuchon has been a translator and part time project manager with Project Moken since 2012. Constantly thinking out of the box, and cross culture, she has made sure the camera can roll in situations which would otherwise have been impossible. Some people just have it. Producer, writer and project manager at Ten Thousand Images AS, having worked in the film industry since 1994. He joined the Project Moken team in 2015 to develop and manage our new initiatives. Sofie graduated in 2011 from a one-year program at the International Center of Photography, New York City, attending the Documentary Photography and Photojournalism program. 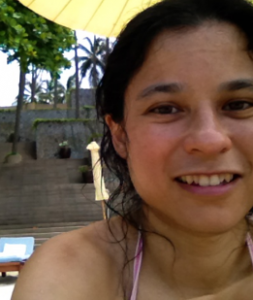 In 2009 she went on the first expedition with the Project Moken team to the Surin Islands in Thailand. Since then, she has revisited in 2011 and 2012. In 2012 Sofie won the London Festival of Photography Prize with her photo-film “I Am Light”, featuring an artist living in an alternative encampment in Norway together with Roma Gypsies. Dive Master, Diving Instructor, and Deep Sea Diver. 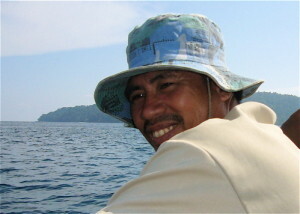 He has several years experience as a Manager for diving-centers in South-East Asia. Thor has been the leader of all underwater operations and sub-surface filming. He was Hook’s instructor for the PADI rescue-diving certificate, and will keep instructing the moken people as an approach towards the goal of establishing eco-tourism on the islands. Lawan Jirasuradej is one of a handful of documentary filmmakers in Thailand. Her own film credits may be short but are honored with many awards: “Mama wa Hunzi” and “La vida: the strength within”. Her role as a local coordinator for productions on location in Thailand is growing thanks to her experiences in film production as well as Thai television reporting. The many projects she has worked on involve minority including sea gypsy, leading her to connect with Project Moken. 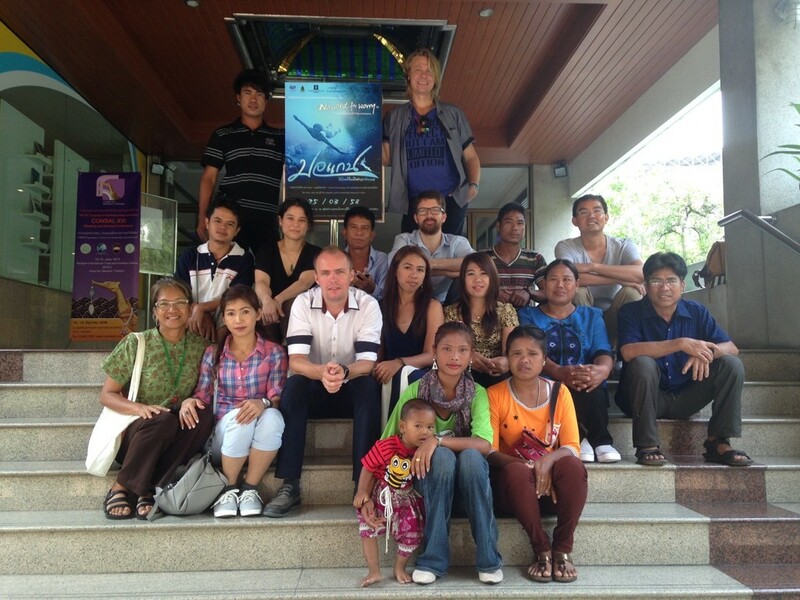 Based in Bangkok, Lawan holds an MA in Film from the U.S. on Fulbright Scholarship. Kristian worked for15 years as a consultant/partner in major advertising agencies (APT, Bates, D’Arcy, DDB) with a wide mix of cross media. Today Kristian Bye is the CEO and co-founder of the award-winning Bright Products. As former business partners in the design company Giraff, Jean and Tormod reunited after a 5 year hiatus, to make great things happen. They kept their promises, and you are experiencing the final product. Enjoy. Reidar Solsvik is the curator at Thor Heyerdahl’s Research Foundation at the Kon-Tiki Museum. He has an MA from the University of Bergen and specializes in Polynesian archaeology. He has carried out excavations on Easter Island and on Huahine, French Polynesia, and done comparative field studies on O’ahu, Maui, Tahiti, Raiatea, Mo’orea, Rarotonga, Upolu and New Zealand. He is also interested in maritime experimental archaeology and the driving force behind the conference Early Man and the Ocean. 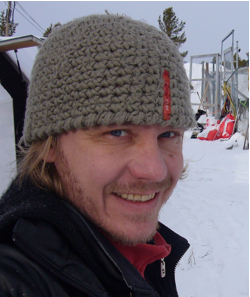 Reidar helped put together the 2010 expeditions and joined us sailing the Kabang up the Norwegian coastline. He is working on future archeological experiments involving the Moken culture and their Kabang boats. Dr. Narumon Hinshiranan, is a lecturer of Social Research Institute at Chulalongkorn University, Bangkok and originator of the UNESCO Andaman Pilot Project, aimed at helping sea gypsies help themselves. 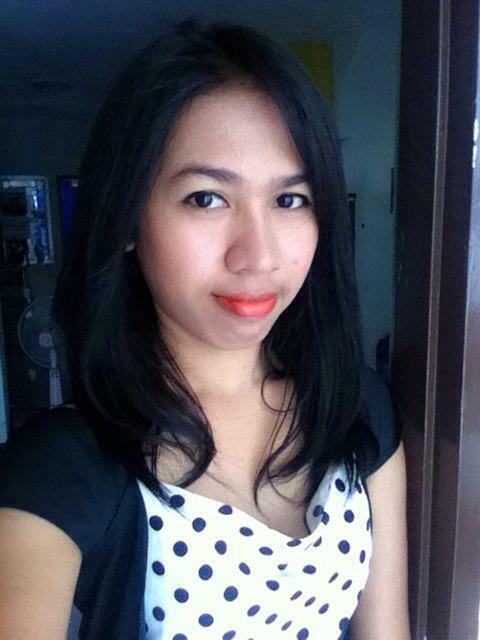 She has been a close collaborator with Project Moken from the start, and is a key advisor to our project. Peder Norlund, owner and CEO of Norlund Filmproduksjon A/S. His pre-production for a feature film project financed an expedition to Mu Koh Surin, where Runar J. Wiik met with the Moken for the first time. He works as scriptwriter, producer, director and cinematographer (DOP). Having completed his education at Den Danske Filmskole in Copenhagen, he has gone on to great success with the feature film ”Ulvesommer”, as well as in numerous commercial films. He is contributing to Project Moken with artistic and production consultations. The team surrounding Project Moken keeps expanding. We are truly lucky to have such great people willing to contribute their time and expertise. Thank you! Catarina Johansen, Anna Parayar, Bjarne Benjaminsen, Jan Palmers, Christopher East, Vera Kvaal, Heidi McCarthy Sheehan, Vidar Starion, John Vedelman, Malmfrid Hallum, Freddy Storhøi, Josefine Edlund, Frøydis Skaug-Andersen, Trygve Fjæstad Andersen, Crossover Labs, Barbara Orton, Sarah Barton, Morten Buljo, Hanne Buljo, Bao, Nan Noisuchon, The people on Koh Lone and Mu Koh Surin, Bao Moken, Scott Williams, Khun Chan (Greenview), Espen Wæhle, Eilert Munch Lund, Muan Mec, Ratt Fix, Synøve Holter, Emilio Cocco, Maria Fuglevaag Warsinska-Varsi, Ola Hunnes, Paul Martin Staff, Julie Luneborg, Emma Rowena Hansen, Nicolay Lange-Nielsen, Transmedia Lab, Veier til Forum, Kikki Engelbrektsson, Iikka Vehkalahti, PeÅ Holmquist, Mark Atkin, Tore Tomter, Arne Emil Christensen, Johan Kloster, Jørgen Langhelle, Christian Berrum, Vegard Paulsen, Georg Buljo, Susanna, Andy Truong, Ian Donald, Arild Molstad, Francesca Koe, Thomas Lein, Thomas Knarvik, Inge-Lise Langfeldt, Ellen Lundby, James Wharram, Hanneke Boon, Inger Stray-Jensen, Trygve Jensen, Sveinung Jensen, Celine Cousteau, Caryn Groce, Svein A. Wiik, Bang Hem, Khun Gita, Charlotte Crawford, Monica Rosengren, Andy Truong, Markus Lind, Martin Klausen, Torstein Nybø. More will be added as we update our records.